In July 2009, YouMedia launched as an ambitious attempt to re-imagine the library as a more relevant learning resource for today’s teens. Understanding that the landscape has changed how teens learn, socialize and self-identify, how do we remix the public library experience so it can truly engage teens in a way that supports its core mission? 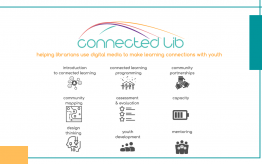 A partnership between the Chicago Public Library and the Digital Youth Network, YouMedia took on this task through the creation of a unique 21st century physical learning space and an innovative online space to connect learners 24/7. The 5,500-square-foot space is open seven days a week to any Chicago teen, where they have access to more than 100 laptops and desktop machines, professional grade cameras and software, and a full music studio all at no cost. More importantly though, they have access to other teens with similar interests, mentors with relevant skill sets and the freedom to self-select the pathways they wish to explore. Teens can choose to participate in workshops ranging from video production, graphic design, gaming and digital music to fan fiction, financial literacy, anime or spoken word. They have direct access to mentors who craft programming around youth interests, are informed by their own experience with digital media and the arts, and are strengthened by an array of pedagogical supports. The YouMedia mentor team is made up of Digital Youth Network’s media arts teachers and CPL librarians. In addition to the physical library space, there is YouMedia Online, our private social learning network. Teens are able to share their work for critiques from others, collaborate on projects, discover new resources, reach out to mentors for support and more. The online space gives youth a central place to build their portfolio of work and clearly identify themselves to potential collaborators by their areas of interests and exhibited skills. While we’ve seen a great number of students take advantage of the physical space, the social network has become a critical component for keeping everyone connected. With one site (we launch 3 new Chicago sites later this year) to serve all of Chicago, we can’t assume all active YouMedia teens are mobile enough to make it downtown as often as they’d like. Through YouMedia Online, they can access the resources to continue to engage from home, a friend’s house or local branch library. Collaboration with community partners has proven to be a critical component of the YouMedia model. 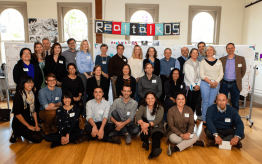 While significant effort is placed into the selection and ongoing professional development of our mentors, connecting with other schools and arts and community organizations has proven invaluable. As a part of our work with the One Book, One Chicago initiative, mentors worked with students from the University of Chicago Charter High School to use digital media to research and develop a plan for redesigning their communities. Students leveraged mobile phones, production tools at YouMedia and exploration in their respective neighborhoods to create a new vision for their communities. This project took a group of selected students to Washington, DC, to present their ideas to the United Nations on World Habitat Day. Teens partnered with Brave New Voices to document and capture the stories of hundreds of youth poets in Chicago for last year’s festival. They’re now continuing to use digital video to explore the root of violence in their communities in partnership with the Cure Violence initiative. More than a year past its launch, YouMedia has seen admirable success. Approximately 2,500 students have taken advantage of the space, 1,300 of whom have engaged in specific programming. The nearly 1,000 teens on YouMedia Online have since shared more than 4,000 digital artifacts ranging from blogs, to short films and photography, to digital music. By far though, the most inspiring results are the interactions that are clear each time you walk into the space or log on to YouMedia Online. Teens are choosing to come to the library after school and on weekends, taking advantage of the resources placed in front of them and often times demanding more. One of the best examples is “Lyricist Loft,” a weekly open mic series at YouMedia. This teen-organized event grew out of a spoken word workshop event at YouMedia and now provides a regular outlet for teen poets and musicians to express themselves. The teens launched the event initially with a few dozen people attending, then with a proactive social media campaign, quickly built it to a series that now sees on average 100+ teens every week. 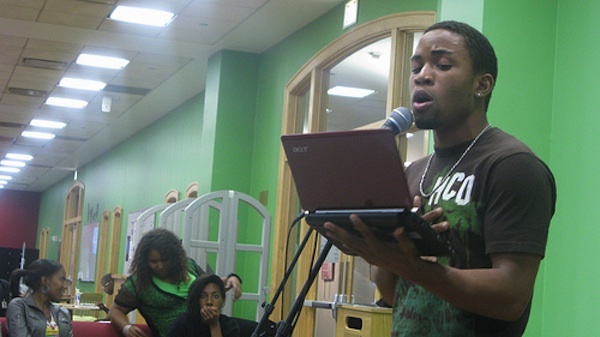 Imagine walking into a library on any given Wednesday evening and seeing more than 100 teens expressing themselves through performance, music, and digital media (live dj spins while videographers stream events live online and audience members reflect and share through Facebook and Twitter). Moving forward, we are anxious to build on the model and expand the capacity to support teens in engaging in various learning pathways in new ways. We are opening three additional YouMedia sites in Chicago branch libraries this year, providing greater access and allowing youth to engage in this work inside of their respective communities. As a part of the Obama administration’s “Educate to Innovate” campaign, the MacArthur Foundation and the Institute of Museum and Library Services have announced the expansion of the YouMedia model through the launch of 30 new learning labs across America. It’s an exciting time and the YouMedia team is looking forward to engaging more institutions around adapting and building on the model. While there is much work to do be done, YouMedia is on a good path to continuing the Chicago Public Libraries’ mission to “support lifelong learning” and provide “equal access to information, ideas and knowledge,” including to today’s teens. Editor’s note: We’re thrilled by our association with YouMedia, but want to acknowledge that YouMedia and the Digital Media and Learning Research Hub are part of the MacArthur Foundation’s digital media and learning initiative to reimagine learning in the 21st century.